This week we are going to talk about the Sheffield Patterned Vases which are above. The two large vases –second vase on the right and the other one is also second from the left are #1700-7 3/4'”rolled edge vases. (Yes, we do like vases and candlesticks.) 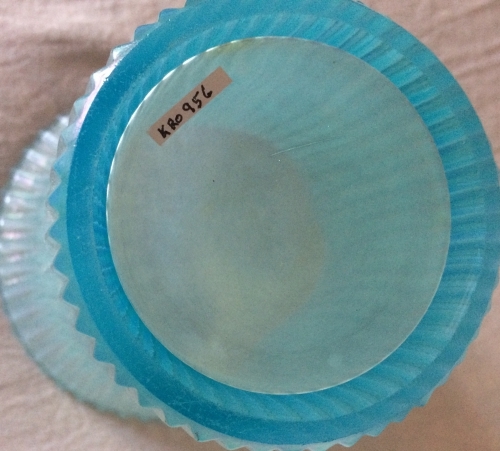 They were made by the Fenton Art Glass Company Circa 1932- taken from Bill Heacock’s book Fenton Glass –The Second Twenty-Five Years in Persian Pearl (white) and Azure Blue (Fenton Catalog color of the No. 38-12 asst. of glass) or also called Aquamarine (light blue which looks like the water near the shore in the Bahamas) iridescent stretch glass. 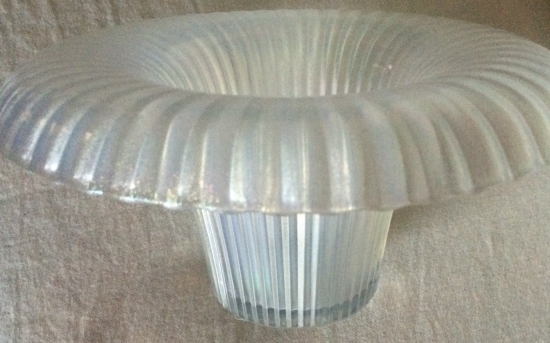 Fenton also used this Sheffield pattern in 1937 with the Silverton (non-iridescent) decoration. Remember molds were and are expensive to make! Different decorations on the molded pieces are much cheaper to make the glass different from other pieces made from the same mold. All of these Sheffield Vases can be used for weight lifting exercising at 2.7 pounds each! The second shape that this pattern of vases comes in is #1700-10 ½” Roll Rim Vase in Persian Pearl. The simple sharp rib design is beautiful. This vase is from the Fenton Museum. The Aquamarine (Azure Blue) #1700-8 1/2'” vase above has almost straight sides with a modest flare at the top. This shape probably was the shape of the mold and all the craft person did was flare the top a little bit. The other two shapes of the vases needed more hand finishing to achieve the shapes. All of the vases have a ground base. The ground bases are an easy way for the glass companies to make the pieces sit flat. The number on the base is our inventory # (hope you have all of your glass inventoried; we are slowly working on that task!). The third picture above shows the edge of the vase which is molded and iridized as well as having a stretch finish. All of the vases are difficult to find almost could be called ‘Rare’, but they are within most people’s price range. Their simple beauty is outstanding! 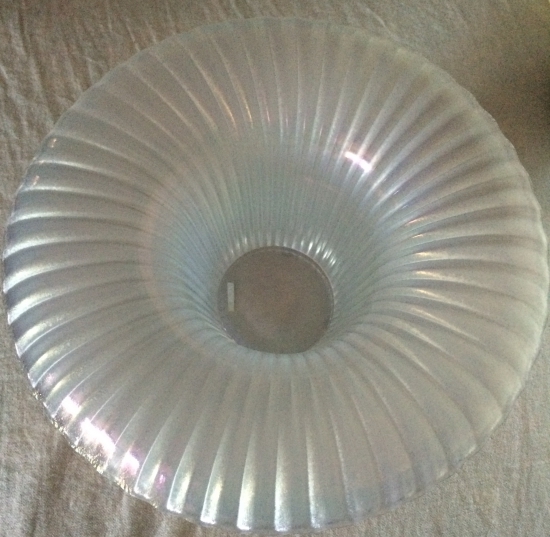 Has anyone seen any iridescent Sheffield vases in any other colors or shapes? If you have, please let us know about them by writing in to Hooked on Carnival Glass. Seen only in frosty white, the iridescence appeared both on the inner and outer surfaces, and was heavy and excellent in quality. 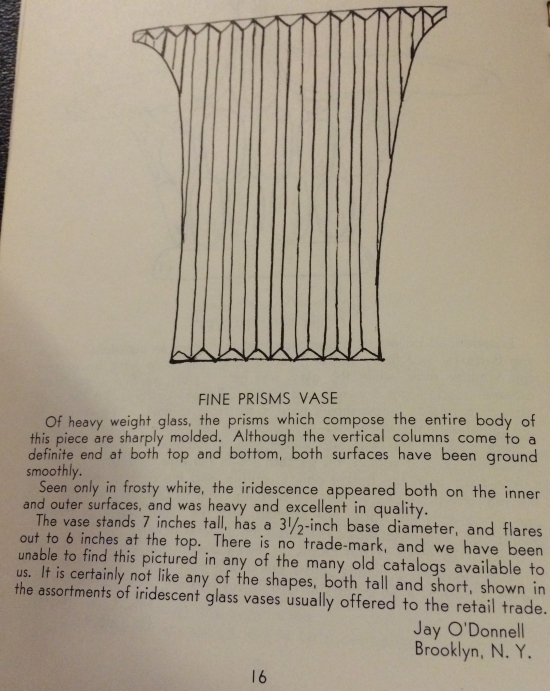 The vase stands 7 inches tall, has a 3 ½inch base diameter, and flares out to 6” at the top. There is no trademark, and we have been unable to find this pictured in any of the many old catalogs available to us. 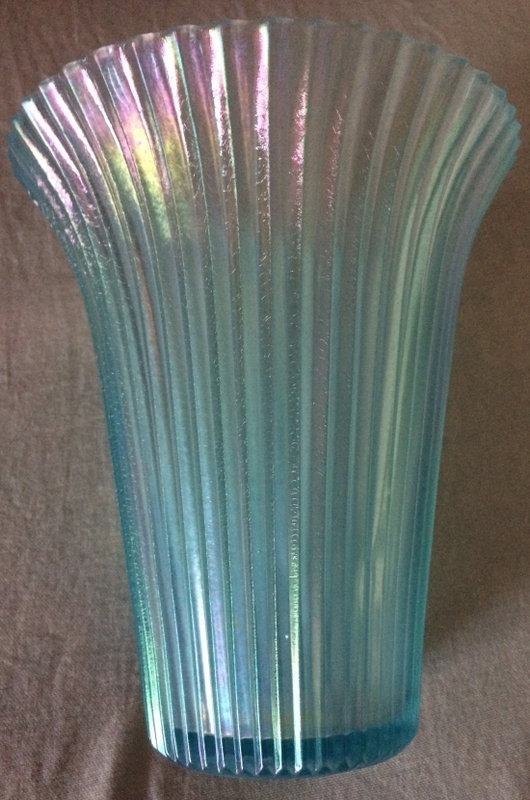 It is certainly not like any of the shapes, both tall and short, shown in the assortments of iridescent glass vases usually offered to the retail trade. 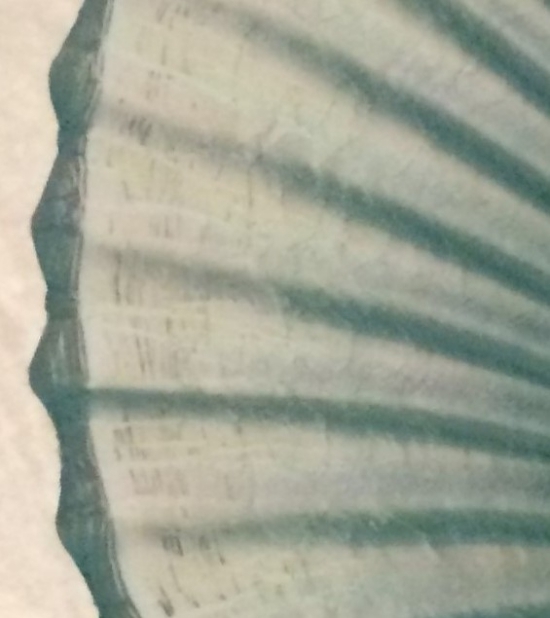 We have come a long way in the ‘Carnival Glass World’ but without researchers like Marion Hartung to lay the foundation; carnival glass might have been over looked in the collecting world. So don’t overlook Stretch Glass; come to the upcoming Stretch Glass Convention starting tomorrow July 27-29, 2016 in Marietta, OH. Hope to see everyone in Marietta, Ohio!!! For more information: http://stretchglasssociety.org.